many things that perhaps you didn't know about the Beetle. AND IT CAN FLY TOO! That's right! The Beetle engine has been used many times in aviation. Many specialized car builders still supply it today, suitably modified for small tourist aircraft. To be noted that the modifications are very little, limited to the feeding system and to the magnet ignition rather than to the coil ignition in addition to the elimination of the cooling system that it is clearly unnecessary in flight. The airplane that you can see in the photo is from the year 1973: built with a 1600 Beetle engine and weighing 295 Kg, it could do a speed of 200 km/h! Around 1950 Heinz Nordhoff, sure of the value of the project and of the reliability of the Beetle, thought up a publicity stunt quite original for that time: he would have given a gold watch and a souvenir nameplate to all the Beetle owners who had exceeded 100.000 Km with no significant repairs or alterations to the engine. Have you already guessed what happened? He soon had to stop the challenge as practically everybody succeeded! In the fifties the Volkswagen summoned Pininfarina to ask him which aesthetic modifications he would have made to the Beetle in order to make it up to date. It seems that Pininfarina had worked on the project for a while and in the end he had given back all the designs, saying: "It's so beautiful as it is: why do you want to change it ?". The only modification suggested by him and later put into practice was the enlargement of a few centimeters of the rear window. We were in '59, the Italian Sunshine Motorway had been recently opened, and only in the first nine months that it had been in operation there were 774 cases of seizure and overheating of the engines. Evidently, cars of that age were not suitable to run nonstop at high speed! Gianni Mazzocchi, the Director and Editer of "Quattroruote", decided to subject the Beetle to a resistance test never tried before: driving two Beetles up and down this motorway from Milan to Bologna for 16 consecutive days, with no interruptions! The two cars make trips up and down for a total of 18.664 km at an average of 110 km/h. There was only a single breakdown failure during the 74TH lap on one of the two cars (the pulley of the dinamo gave way). After a speedy repair it carried on to complete 100TH lap as well. But not satisfied by its incredible performance, and stirred up by the Volkswagen technicians who invited them to continue the test, the test-drivers went on with the venture, but this time they accelerated to the maximum. The next trips were performed at an average of 126 km/h corresponding to about 3800 RPM, that was approximately 500 turns superior to that declared by the Company. 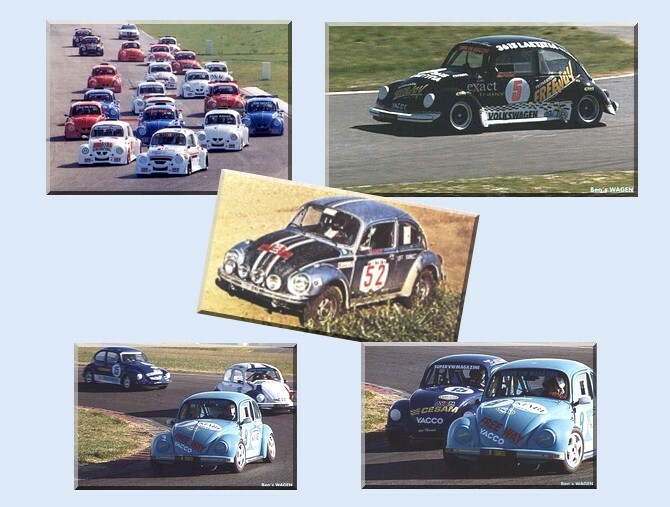 The "fearless" number two Beetle gave up on the 118TH passage due to a drop in the engine pressure, while number one carried on the race, arriving at the 200TH lap at a total of 37.328 km. During the Second World War the scarcity of petrol obliged forces to find an emergency solution, so they invented a new fuel-firewood! The Kubelwagen that you can see in the photo had a burner installed in the front bonnet and it was fed with gas produced by burning coal. And to think that here in Italy they wanted us to believe that we had had problems using unleaded petrol in our Beetles! THE CAR OF HIGHEST ENDURANCE. "So far the car that has covered the most kilometers and is still running, is a 1963 Volkswagen Beetle that belongs to Albert Klein from Pasadena, California, U.S.A.
Until 25TH January 1994 it had covered 2.434.575 kilometers". The Beetle that you can see in the photo is a very special model named "Escape from Berlin". The reason? The fuel-tank was modified making space out, which allowed a person to be hidden in order to go beyond the Wall in the western part of Berlin. About fifty people succeded in crossing the border in that way. Today we can see the car in the Museum of the Check Point Charlie. And to think that the Beetle has always been blamed for having a not very roomy boot! This was the nickname that the Germans gave to the Beetle when they began to see the first models out on the German roads, while a famous American journalist had even called it an "orthopaedic shoe"! The Italian nickname "Maggiolino", instead, is rather suitable (perhaps the prettiest); but what do the other Countries call it? In America and in England they call it "Beetle", in Germany, Austria and Switzerland "Käfer", in Belgium and in the Netherlands "Kever", in the former Yugoslavia "Buba", in Spain "Escarabajo", in Portugal "Carosca", in Brasil "Fusca", in France "Coccinelle", in Sweden "Bubbla" and in Mexico "Sedan". The Beetle is the car that more than any other has appeared in films and advertisments. It even played a leading role in the famous and successful series "Herbie", it had never happened before to a car. By the way, in addition to "Herbie", there are so many other apparitions of the Beetle in films that it is difficult to make a list of all of them, therefore I will just write those films I happened to see. The place of the strawberries by Ingmar Bergman, 1957; The sleeper by Woody Allen, 1973; Dellamorte Dellamore by Michele Soavi, 1994; Clockwork orange by Stanley Kubrick, 19xx. And the Walt Disney series already mentioned: "The love bug", "Herbie rides again", "Herbie goes bananas", "Herbie goes to Montecarlo" and the German "The Beetle Dudù against lions, panthers and zebù". No, I'm not revising geography! This is the list (and it is not even complete) of the Countries which have used the Beetle as Police-car; and that, despite the performance of our car can't really define as a sports car (at least if they keep it in its original version). Although, I would like to say, that if half the world has driven it as a Police-car, there must be a reason! Maybe it's because it's more important that it doesn't let you down during a carchase than the performance itself!!? In 1963 a ruby-red Beetle passed one year in Mawson in Antarctica, in an Australian research station. The Beetle, model 1962, was built in Australia by the Volkswagen Australasia Pty Ltd, with lots of local car components. Bodywork, engine, glass, electrical system, paint and tyres of the Beetle "Down Under" built in sixties, they were in fact produced in Australia without using kit from Germany, as instead other Countries had done. Therefore it was the first production model that circulated in Antarctica: that explains the name "Antarctica 1" assigned by Volkswagen. Instead, scientists nicknamed the Beetle "Red Terror" because of the colour of the body which stood out against the white landscape. During that year in Antarctica, the Beetle was used as means of transport for people and things. The car had to endure heavy snowfalls, violent winds and it travelled on snow and ice for a long distance, sometimes on such inaccessible grounds even to sleighs towed by huskies. At the end the Beetle was repatriated and replaced by a new one: "Antarctica 2". But "Red Terror" did not retired. A few years later, it even came first at the BP Rally, an exhausting three thousand Kilometers race along dirt roads in the South East of Australia. When the war was just ended, in that period in which nobody knew what to do of the Wolfsburg factory, some models of the Beetle were sent to England for being examined by a car industry committee. The Army was interested in the assessment that such a committee had to say, so they could consequently decide what to do. This is, in short, the evaluation of the shortsighted British commetee: "The vehicle is of no interest... it does not comply with any elementary technical requirements of a car... its qualities and the design are not attractive at all for the average car driver...it is very unaesthetic and noisy..." and, above all, "It is that kind of car that is popular only for two or three years, at the latest". We really must say: no comment! 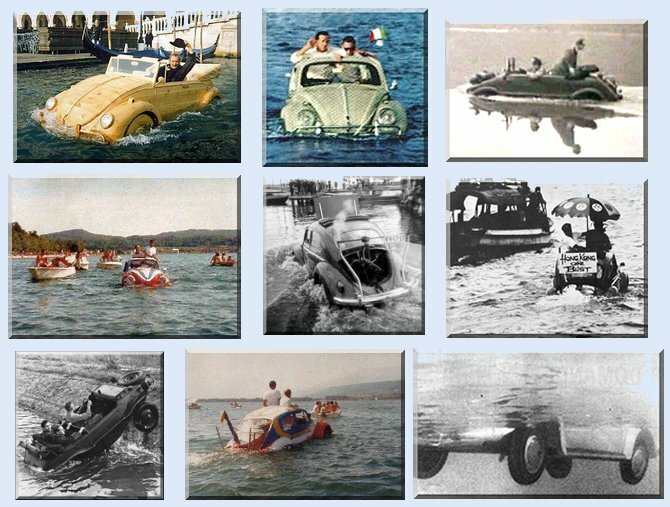 Let's now hear what Bernard Carat, an important journalist for a specialist French magazine, in '58 wrote :"It is impossible to drive the Volkswagen: it seems criminal to us thet this sort of car goes, as it often happens, to young, unskilled hands... It is completely old-fashioned: it has benefited from insignificant inprovements, not to say of any importance... It's got one, single, strong point: the air cooling system and the vigour and the dynamism in the service trade that has assaulted a world-wide market... By dint of doing nothing, it's easy to imagine that the technicians at the Volkswagen are not able to take maximum advantage of Porsche's technical inheritance and to make the factory proceeding... The inside and the general equipment are miserable. Finally, it is not sold even at a particularly interesting price". What can be added?